From 1938 on the superheroes enjoyed great popularity. So successful were some of them that they quite frequently outsold news stand magazines like Time and Newsweek. Captain Marvel reportedly sold over 2 million copies per month at it's peak and other titles commonly sold close to a half million or more copies making them extraordinarily ubiquitous in American society. 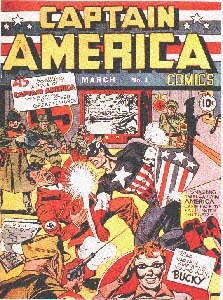 When World War II began, all the comics chipped in to the war effort. All the comic characters fought the Nazi's and the Pacific fleets. One such hero even preceded our entrance into the war by several months. This super hero, was fighting the Nazis in February 1941 when Captain America blasted onto the scene, created by comic giants Jack Kirby and Joe Simon. The cover featured Captain America socking Hitler on the jaw! But as the war ended, so did it seem the golden age of super heroes began to wane. But there were other formats for comic books. Funny animals were very popular as was evidenced by the tremendously successful Walt Disney's Comics and Stories, which reportedly had very high sales. Science fiction had it's own niche in Fiction House's "Planet Comics" which started in January 1940. Even the teen idol "Archie" also had high sales figures. But the comic companies that had slowing sales figures needed something new, different and exciting to revitalize their net profits. So here it was, late 1946 and some publishers began to take note of small publisher Lev Gleason. Gleason had a almost unnoticeable section on the news racks because he only sold a hanincr=F|dful of titles. 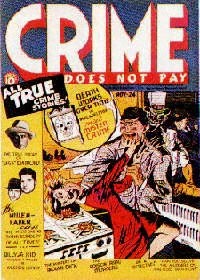 One was Daredevil Comics which sold very well, and another was titled "Crime Does Not Pay", which first came out in 1942. It was a highly successful title, depicting according to the blurb on the cover "ALL TRUE crime stories". The covers were real gruesome events. On one a maniac is forcing a woman's head onto a burning stove top, on the next three guys are blasting away with machine guns at a bloodied bank teller, the next cover had a bloodied man thrown from a speeding car and yet another had a guy about to hack a woman with a cleaver while there were five dead men "hanging" from a tree limb nearby. It is not difficult to understand why this title was so popular, but it is difficult to understand why comic publishers took so long, five years, to cash in on the crime title's success. So here it was, 1946/47 and suddenly a whole assortment of crime comics were coming out. True Crime, True Western Crime, Women Outlaws, War Against Crime and Crimes By Women. EC publisher Bill Gaines was converting titles like International Comics into Crime Patrol, and crime comics were all over the place, and they were a smash, and the companies profits soared again. Another genre that began to flourish was horror comics. In 1948, ACG had come out with Adventures into the Unknown, and the previous year Avon Publishing, a paperback publisher looking for new revenues, would jump in with the short lived Eerie Comics. But something that all comics enjoined was an artistic instead of literate contribution to comic books. It would later be called good girl art, and some of the main features of this art were the way the women were depicted. Large breasts called headlights were adopted. 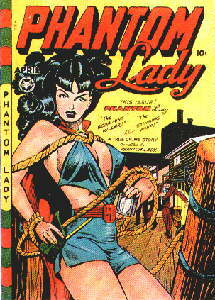 Women were dressed as scantily as the editors would allow showing as much cleavage as possible, and the rear view of a woman bent over was a very common sight. WOW I say! Unfortunately, though this could not have come at a better time for the comic companies, it also could not have come at a worse time. Sometime around this same time, as the story is related to me by noted comic author an historian Greg Theakston, comic publisher and publisher of the popular Betty pages magazine; at a family outing a mother who was looking for her son found him hiding and reading a comic book. The irritated mother looked at the comic and saw..half naked women, large breasts and who knows what else and went to her husband with the offending publication. It was a fretful moment, the woman's husband was a United States Senator. The comic book was reportedly Lil Abner. I guess she had never seen Daisy May before. After the party, the senator spoke with his fellow senators and before long a panel had been convened to study the effects of comic books on American society, in particular the effects they had on children. Still, comics were selling faster than ever and in 1950 new changes were coming to the field. The emblem of that change was EC. next: EC and the horror explosion.